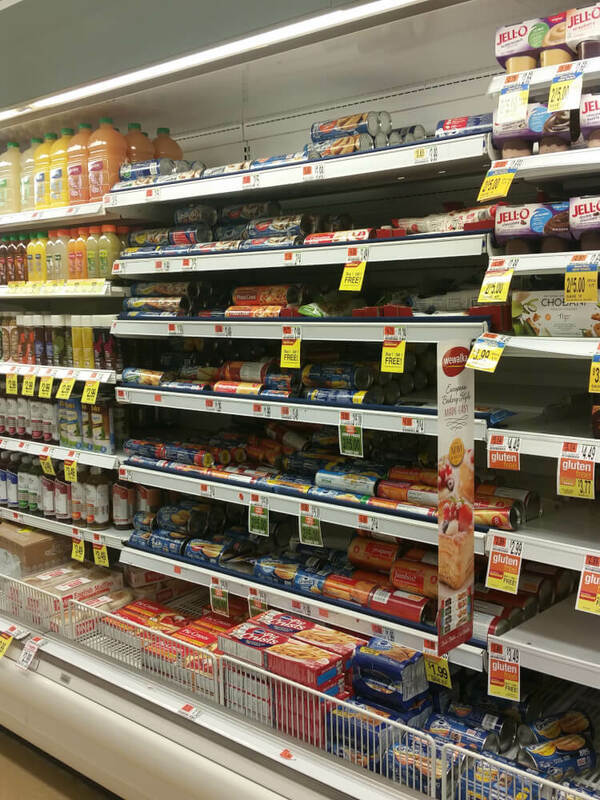 This is a sponsored conversation written by me on behalf of Shaws. The opinions and text are all mine. 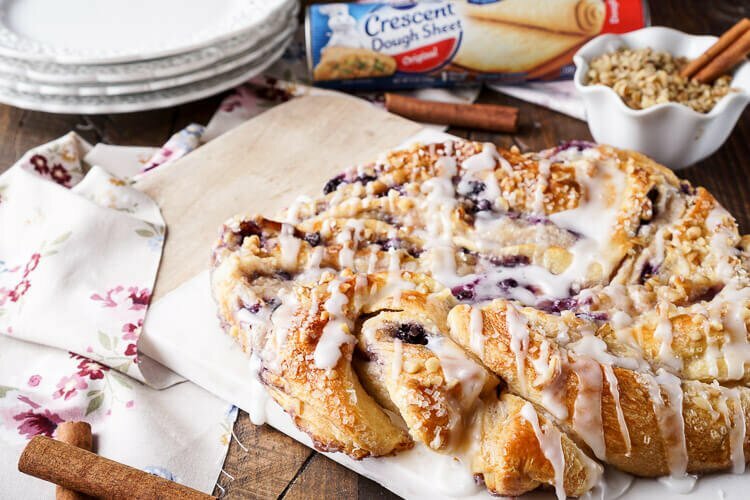 This Blueberry Spice Cream Cheese Ring is the perfect addition to a holiday brunch. 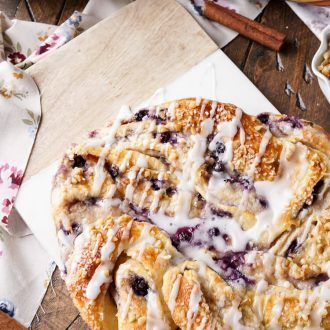 A simple and sweet filling is wrapped up in crescent dough and topped with chopped pecans and icing for a delicious morning pastry the whole family can enjoy! Thanksgiving may only be a couple weeks away, which is kind of insane right? Anybody else already so exhausted they could sleep right through until the new year? I’m honestly not sure how I was working 40 hours a week at a day job on top of all this just 2 months ago. Obviously the holidays are a busy time of year in creative blogging, much like it is in retail during Q4, but I could really use a nap, or an assistant, or an IV of Red Bull. Or something, just something, send it and send it fast! But while the craziness may be impacting my TV watching time (Hey there, four day old episode of The Walking Dead that hasn’t been watched yet), it’s definitely not hindering my creativity in the kitchen! Did I also mention that it’s been oddly warm this fall, like I legit had my windows open yesterday… in Maine, on November 10th… that’s NOT normal. I’m pretty sure mother nature is just trying to sweeten us up before the terrible winter they’re predicting arrives. But the warm weather has got me thinking. Right now it seems like everything is pumpkin this and cranberry that, oh and have you heard of the term “Minter”, yeah there will be lots of peppermint chocolate creations coming down the pipeline, I already have four planned for you guys! Anyways, I decided that today we’re going to embrace these unseasonably warm temps and we’re going to be highlighting BLUEBERRIES! 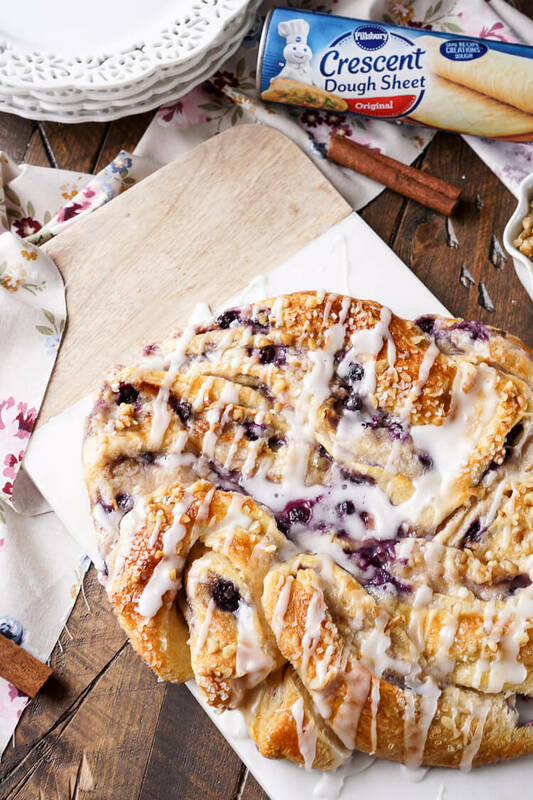 Sure, they’re a summer fruit, but they’re delicious and with a touch of cinnamon they fit right into a holiday breakfast! Especially here in Maine, we’ll eat blueberries anytime, anywhere, unless you’re my husband (weirdo)! I was excited to have a nice big bag of native berries in the freezer from this summer to pair with a little cream cheese, sugar, and pecans for this dish. 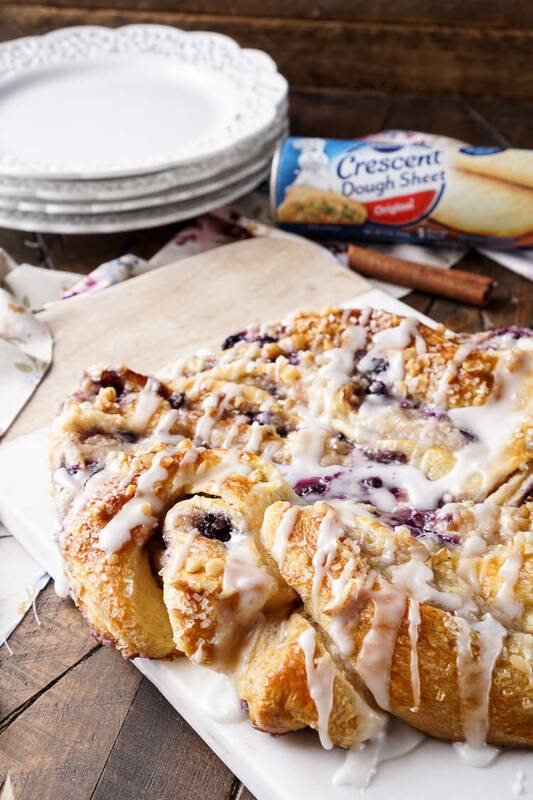 It was so easy to swing into Shaws to grab some Pillsbury™ Crescent Roll Sheets and make this dish! 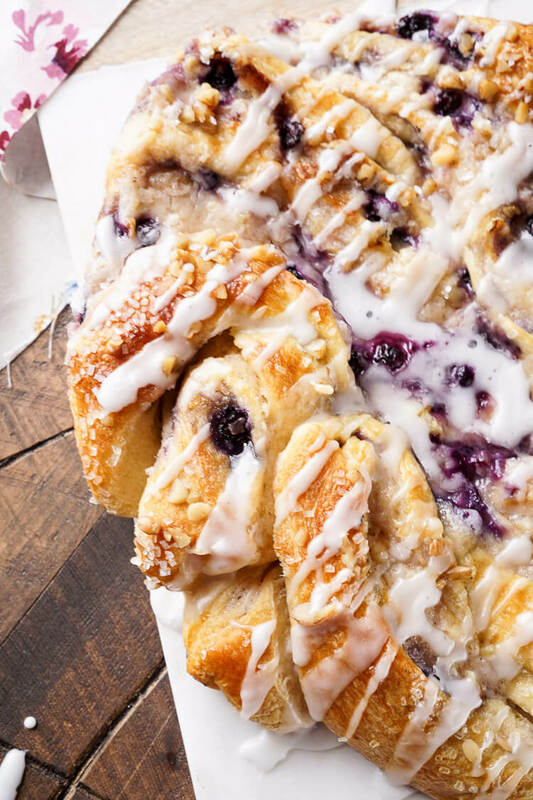 You just whip it up, spread it on, roll it up, slice it, braid it, and bake it! 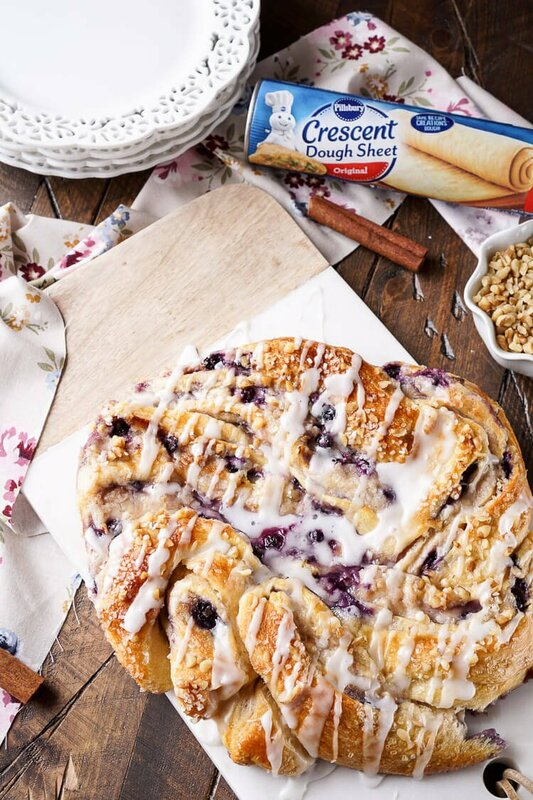 Spray baking sheet with cooking spray and roll out Pillsbury Crescent Dough. In a large bowl or stand mixer fitted with a whisk attachment, beat cream cheese, sugar, cinnamon, and vanilla until light and smooth. Spread evenly over the rolled out dough, leave a 1 in. boarder around the edges. 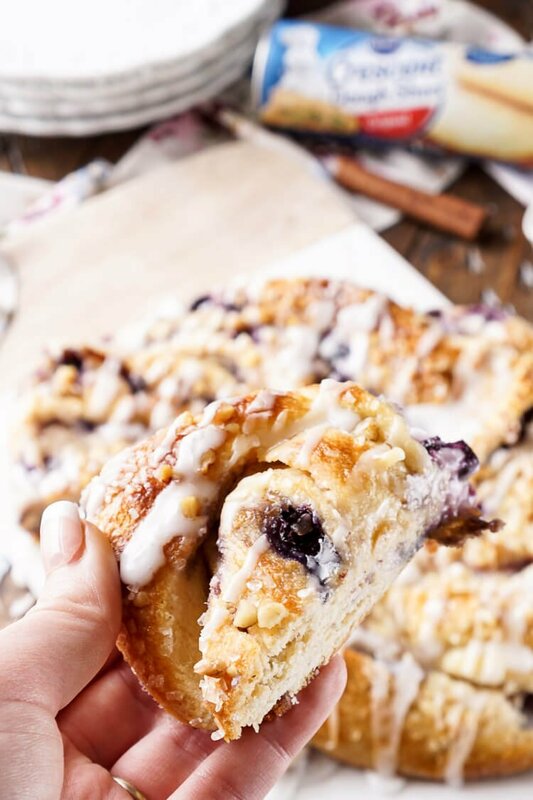 Sprinkle with 1/4 cup of the pecans and the blueberries, roll up starting with the long edge and pinching together the ends when you're done. Cut the rolled up dough lengthwise and twist it together and shape into a circle by pinching the ends together. You can bake it right on the pan, or transfer to an 8 in. round baking dish or pie pan to help it keep it's form and make for easy serving. Brush the bread with the beaten egg, then sprinkle with remaining nuts and coarse sugar. Bake for 25 to 30 minutes until top is golden brown. 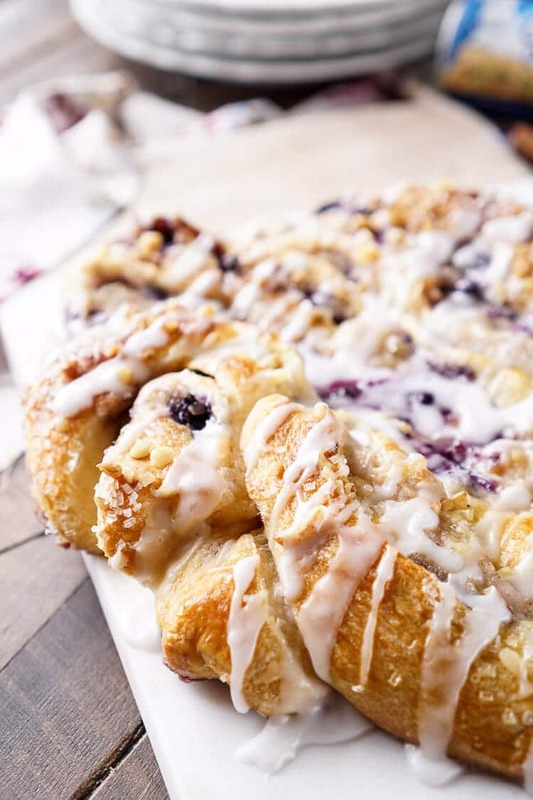 Once it's done baking, stir together confectioners' sugar and milk or water in a small bowl and then drizzle the icing over the freshly baked pastry. This recipe was inspired by this Nutella Crescent Ring which has great step-by-step photos. This is a sponsored conversation written by me on behalf of Albertsons Safeway (please use name of your local store) . The opinions and text are all mine.